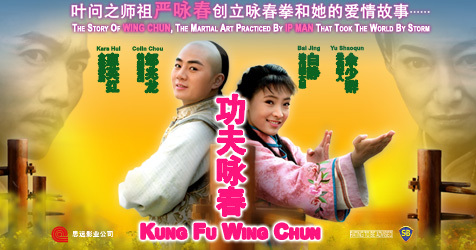 The fascination with the art of Wing Chun Kung Fu continues with this China production from our old favourites Seasonal Films who produced such classics as Drunken Master and Invincible Armour. Yim Wing Chun is a young vibrant girl, a tomboy in her attitude and always getting into trouble in and around the restaurant which her father owns and she works. A local villain, Gao Shing want to marry Wing Chun and after a fight which he almost wins, sets a date on which to return and claim his bride. Also in town is Shaolin nun Ng Mui, who has fled the temple after it was destroyed by the government. The two women meet, become friends and after witnessing her fight with Gao Shing she decides to teach Wing Chun her style of Kung Fu and help with her upcoming challenge. On the big day she wins, but there is a new threat in town as government officials track down Ng Mui and there follows a fight to the death, with Wing Chun trying to save her teacher and family. Directed by Joe Cheung, Kung Fu Wing Chun is a strange hybrid of a film, solid cinematography and an ok budget the film does tend to have the look of a tv movie at times and some of the CGI used is very obvious (mainly for scenery as opposed to the fight scenes). Bai Jing is excellent as Wing Chun (she was trained in the art for the film by Ip Chun, Ip Man’s son), feisty but beautiful she brings a sense of fun to the movie and I hope we see her in more roles in the future. Its great to see some old faces return to the screen, Kara Hui plays nun Ng Mui and she still looks as she did in the old Shaw Brothers classics My Young Auntie and Martial Club! There is a small cameo by Yuen Wah and the main villain is played by Colin Chou from Bodyguard From Beijing and The Matrix sequels. He still has some great moves and almost steals the show. The choreography is very good, ground-based with very little wirework and the Wing Chun style depicted is mostly genuine with some theatrical moves used for cinematic effect. What does detract is the sudden shift in tone from the jovial comedic first half to the bloody and very violent finale. If you enjoyed the recent run of Wing Chun based movies then you should enjoy this too, a slightly different take on the Kung Fu legend and its origins. There is only one out of print DVD which has been released in Taiwan which does have English subtitles. If you enjoy Wing Chun themed movies then this is recommended if you can find it. A sad footnote to this film is on 28 February 2012 Bai Jing was murdered by her husband Zhou Chenghai, who took his own life shortly after the murder.